The term stem cell is generally used to describe cells that are totipotent, pluripotent, or multipotent. Totipotent cells have the capacity to differentiate to all cell types, including somatic cells, germ cells, and certain cells that exist outside the embryo and are important to fetal development that are termed extraembryonic cells. Pluripotent cells may differentiate to cells of most types, and multipotent cells are capable only of differentiating to certain types within a group of cells that perform similar functions. The term stem cell is also used in reference to any adult cells that are capable of assisting in the restoration of adult tissue via self-renewal. The use of the pluripotent and/or self-renewing qualities of stem cells is believed to have therapeutic benefits for the regeneration of tissue in humans. Such tissue renewal may be accomplished via the use of adult stem cells, or embryonic stem cells, which may be derived from a human embryo in the blastocyst stage. The use of embryonic stem cells has been a source of considerable controversy due to its sacrifice of human embryos in the blastocyst stage, which some people view as the destruction of human life. Nine days after spinal cord injury, mice received four injections bilaterally 0.75mm from midline at both the anterior aspect of T10 and the posterior aspect of T8. Each site received 250 nl of cells or vehicle. After sixteen weeks, the injured mice who received human stem cell injections experienced a significant improvement in the motor functions that had been impaired by their injuries. Furthermore, the use of diphtheria toxin -- which is far more toxic to human cells than mouse cells -- to destroy the human neurons in the mice reversed the observed improvements in motor function. This result suggests that the observed increase in motor function was indeed produced by neurons derived from the human embryonic stem cells. Cross-species transplantation was possible without the rejection of the human embryonic stem cells by the mice's immune systems because the mice were genetically modified to suppress certain immune responses that would have interfered with transplantation. Properly controlled, adequately sized studies have yet to demonstrate that human embryonic stem cells have medical value in humans. express hESC pluripotency markers... DNA fingerprinting with human short tandem-repeat probes... shows with high certainty that every NT-hESC line derived here originated from the respective patient donor and that these lines were not the result of enucleation failures and subsequent parthenogenetic activation. Ironically, the authors of this study deride "cruel hoaxes... regarding human... cloning", a reference the claim of Clonaid that it had produced five cloned human infants. This study was retracted when it was discovered that the authors had falsified their data. Researchers have recently described new lines of stem cells derived from amniotic fluid. Such cells provide a potential alternative to embryonic stem cells. Ethical objections to the use of human embryonic stem cells revolve around the destruction of human embryos in the blastocyst stage to obtain the stem cells. Those who oppose this practice often argue that human life begins from the moment of conception, and that, therefore, destruction of a blastocyst stage embryo is morally equivalent to abortion and infanticide. However, supporters of embryonic stem cell research frequently contend that even the comparison to abortion is inappropriate, since while a several month old fetus might have sufficient neurological development to be conscious in some meaningful sense, a human embryo in the blastocyst stage has so little development that one can safely conclude that it cannot exist as a conscious being. the somatic stem cell play[s] its role when cell division conflict[s] with function (e.g. stem cells suppl[y] neuroblasts when neurons [can] not afford to sacrifice half their synapses for the sake of cell division). Brains harvested several months after the transplant... and examined by light microscopy revealed the presence of GFP1 cells throughout the CNS, including the olfactory bulb, hippocampus, cortical areas, and cerebellum. A major signal transduction pathway present in neurons is also intact in bone marrow-derived cells that express neuron-specific genes in the brain. Thus, the study clearly demonstrated the in vivo pluripotency of bone marrow derived stem cells in mice. However, a far smaller percentage of bone marrow stem cell derived neurons were observed than in the analogous, previously described study on mice: the human study "found 2-5 Y-positive neurons per 10,000 human neurons vs. 50 per 10,000 rodent neurons. ", which may indicate that bone marrow derived stem cells had a reduced efficacy in producing neurons in humans, possibly due to a reduced pluripotency. In November of 2007, two groups of researchers simultaneously reported a method of reprogramming somatic cells (i.e., skin cells) into pluripotent stem cells, . The process requires the activity of four different genes and in these pilot experiments the genes are inserted into the skin cells using a retrovirus. This is not ideal as there is the potential for tumor growth in tissues derived using this methodology; new methods are now required to activate these genes without the invasive use of the virus. The research on adult stem cells suggests that they may have significant medical value since they can migrate to organs other than those from which they were extracted and can differentiate to cells of the appropriate type. Further, the use of adult stem cells holds great promise in mitigating much of the ethical debate over embryonic stem cell use. The therapeutic benefits for adult stem cells, however, are not proven and further study is necessary to demonstrate their safety and efficacy in practice for curing medical problems via tissue regeneration. ↑ De Coppi et al. 2007. 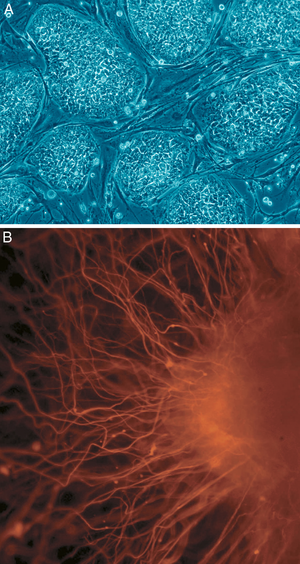 "Isolation of amniotic stem cell lines with potential for therapy." Nature Biotecnology 25: 100-106. This page was last modified 05:44, 6 February 2010.